Nicholas Presto joined Jacobs & Dow in 2016, after spending the beginning of his career with a Hartford insurance defense firm. His practice now focuses on representing people injured in car crashes, falls, and from other causes. Nick has experience dealing with issues of automobile liability, uninsured/underinsured motorist coverage litigation, premises liability, and products liability. His early training on the "defense side" helps him advocate effectively for clients who have been hurt by the negligence of others. 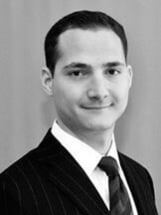 Nick also has a strong interest in criminal law and a passion for preserving constitutional rights. He majored in Criminal Justice at Quinnipiac University, earning a bachelor's degree with distinction. He served as a certified legal intern in the Criminal Appellate Advocacy Clinic at UConn Law School. His work there assisted in obtaining a reduced prison sentence for a client. At Jacobs & Dow, he enjoys his work in the firm's wide-ranging criminal defense practice, which includes major felonies and white collar crime. Nick earned his Juris Doctor with honors from the University of Connecticut School of Law. During law school, he competed in the Alva P. Loiselle and William H. Hastie Moot Court Competitions. He was also awarded CALI Excellence for the Future Awards in two courses: Lawyering Process II and Healthcare Insurance and Finance. Nick grew up in and around New Haven and has deep roots in our community. He graduated from Xavier High School in Middletown and Quinnipiac University. He lives in Wooster Square. In his spare time, he enjoys playing guitar, golf, and spending time with his family and friends.